Enough old news, let's wrap up this not-so-lost city. In today's episode we wrap up quest six, and attempt to steal the most powerful wand in the world from the surprisingly intact ruins of Troy. We keep hearing about the insane god the Trojans worship, but really what are the chances such a thing exists? 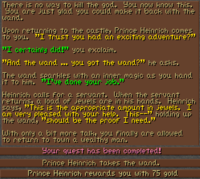 And that is it for quest six! 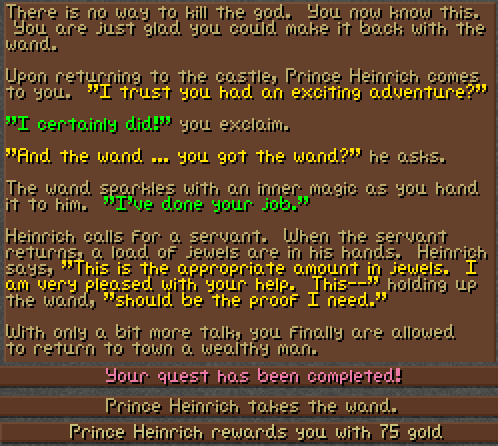 We have now given the most powerful wand in the world to the surprisingly elderly prince Heinrich. Just how old is king Gregor anyway? Surely this prince will turn out to be a decent guy. I'm sure there was a legitimate reason why the only artifact that would serve as proof of the city's existence was the Wand of Disintegration. I bet he uses it to dig orphanage construction foundations. Sure feels good to be such great heroes. Only one more quest to go! My work schedule still hasn't let up, so we'll probably stay on the one-video-per-week schedule we've been on for most of 2013.